This is my version of an old game known as "Color Lines". Installation: just extract the downloaded archive anywhere. Run the game binary (./kambi_lines on Unix, kambi_lines.exe on Windows). You can run the program with --fullscreen command-line option, the game will then change screen resolution to 640x480 and run in fullscreen mode (this is what original DOS "Color Lines" were doing). You play on a square board, with 9 x 9 fields. Every field is either empty or one colored ball is there. In each your move, you choose one ball and move it from it's current place to some other place on the board. There must exist some clear way (not blocked by other balls) between the current place to some other place of the ball. After your move, new 3 balls will appear in random places on the board. When you arrange 5 or more balls of the same color side-by-side in one row, column or diagonal, then the balls disappear, you get some points, and you get free move (i.e. no new balls will appear on the board after such "winning move"). So basically the board gets cluttered with balls more and more, and you have to struggle to keep it clean. Your goal is to collect as many points as you can, until the board is whole filled with balls and then the game ends. 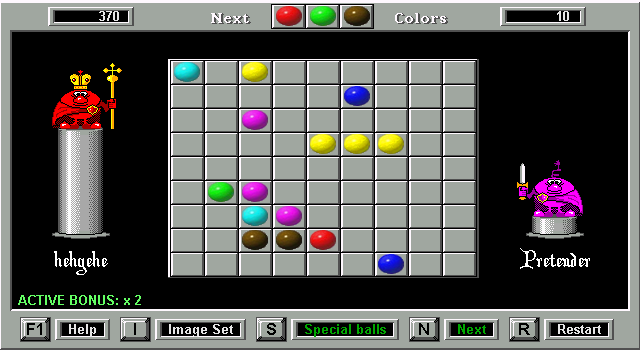 In my version of this game, there are some addons: there are two-colored balls and joker balls (can play a role of any color), and you get bonus points for making one "winning move" right after another. If you received some points in previous move (because you arranged some "matching line") then you will get doubled amount of points for arranging a matching line in this move. If you will manage to get these points, then in the next move you will get tripled amount of points for arranging a matching line. And so on, as long as in each successive move you will manage to arrange some matching line. In lower-left corner you will see the text "ACTIVE BONUS: x ..." that shows how the points for the current move will be multipled. If the "Special balls" mode is on, then you can get on the board two-colored balls (red-white and blue-yellow ) and joker balls ( ). Two-colored balls can be used as a substitute of any of given two colors. Joker ball can be used as a substitute of any color. ... create a matching line. There is one matching line of white color, and one matching line of red color. You will get 12 points (6 balls * 2) for arranging such line on the board. In each matching line there must be at least one normal (one-colored) ball. So e.g. you can't make a matching line using 5 joker balls. Concept is closely based on original DOS "Color lines" game by Olga Demin (programming), Igor Ivkin and Gennady Denisov (graphics). Most of graphics are copied from that game. We use them without any permission, hoping that it's OK — as the DOS version of this game is "abandonware" since a very long time. So, credit for graphics goes to Igor Ivkin and Gennady Denisov, who made cool graphics for the original DOS "Color lines". The graphics for the default set of 7 balls are a modified version of "KDE Lines" graphics. Splash screen was made by rayhunter.